This entry was posted in Miscellaneous and tagged Apex Red, colony PCR, gel, M13F/R, O'geneRuler DNA Ladder Mix, OsHV ORF117, OsHV-1, PTC-200 on 16 August, 2017 by kubu4. 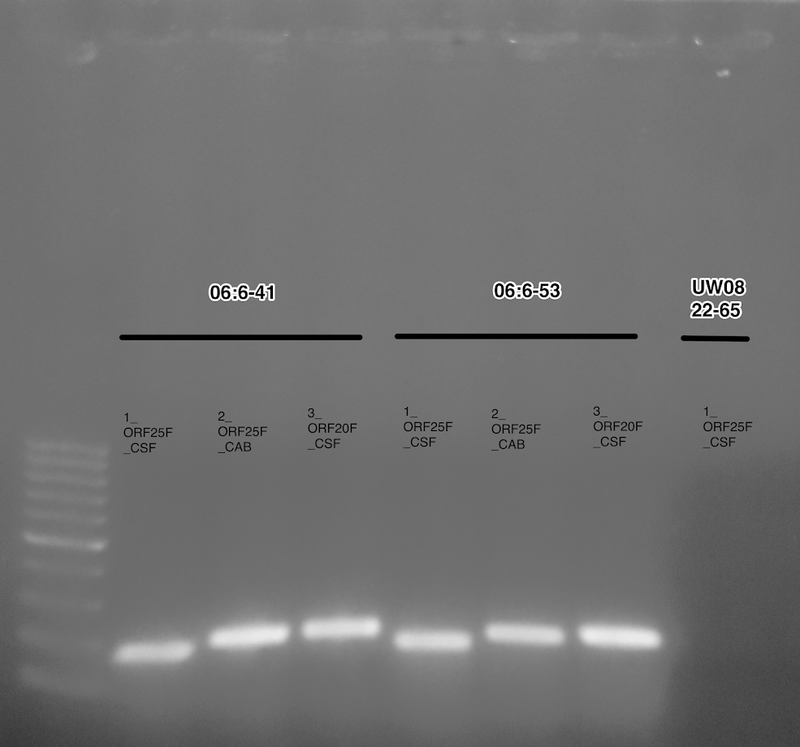 Colony PCRs were performed on each of the transformations from 20151015 (RLOv_ DNA_helicase, RLOv_head_to_tail, RLOv_membrane_gene_1, RLOv_membrane_gene_2, RLOv_tail_to_fiber) to confirm successful ligations in plasmid pCR2.1 using the M13F/R vector primers. Colonies were picked form the transformation plates with pipette tips, re-streaked on a secondary, gridded, numbered LBAmp100+x-gal plate and then used to inoculate the respective PCR reactions. Six white colonies (positive clones) and a single blue colony (negative clone) were selected from each transformation. Restreaked plates were incubated @ 37C O/N and then stored @ 4C (Parafilmed). 30μL of each reaction was run on a 1% agarose 1x Low TAE gel, stained w/EtBr. All the PCRs look good. All white colonies selected contain a PCR product of appropriate size (i.e. larger than the blue colonies; negative [-C] control). Will select clones #1 from each to grow up for plasmid prep. This entry was posted in Abalone Withering Syndrome Phage ID, In-situ Hybridization, qPCR Standard Curve and tagged Apex Red, bacterial plates, gel, O'geneRuler DNA Ladder Mix, PCR, pCR2.1, pics, pictures, RLOv_DNA_helicase, RLOv_head_to_tail, RLOv_membrane_gene_1, RLOv_membrane_gene_2, RLOv_tail_fiber_gene on 20 October, 2015 by kubu4. After yesterday’s confirmation that the qPCR primer/probe sets for RLOv DNA helicase and head-to-tail were functional and specific for the RLOv, I needed to generate PCR products to clone and sequence. Samples were run on a 0.8% agarose 1x TBE gel, stained with ethidium bromide. Amplification looks great. No amplification in no template controls (NTCs). Excised bands and purified products using Ultrafree DA Spin Columns (Millipore). Samples will be stored @ 4C until I am able to clone them for sequencing. This entry was posted in Abalone Withering Syndrome Phage ID and tagged 06:6-54, Apex Red, black abalone, gel, gel extraction, Haliotis cracherodii, phage, PTC-200, RLOv, RLOv_DNA_helicase, RLOv_head_to_tail, Ultrafree-DA on 9 October, 2015 by kubu4. No template controls (NTCs) were also run. All samples were run in duplicate, in 0.5mL PCR tubes. Samples were held O/N at 4C. Will run on gel tomorrow. This entry was posted in Abalone Withering Syndrome Phage ID, In-situ Hybridization and tagged Apex Red, black abalone, Haliotis cracherodii, in-situ hybridization, ISH, phage, PTC-200, RLOv_membrane_gene_1, RLOv_membrane_gene_2, RLOv_tail_fiber_gene, withering syndrome on 7 October, 2015 by kubu4. After previously confirming that the issue with previous PCRs was due to bad reagents, I re-ran the PCR on the clam RLO DNA isolated 20150130 using a set of universal 16s primers, as well as a universal 18s primer set to serve as a positive control that amplifiable DNA was present in the sample. Samples were run on 1.0% agarose, low TAE gel stained w/EtBr. 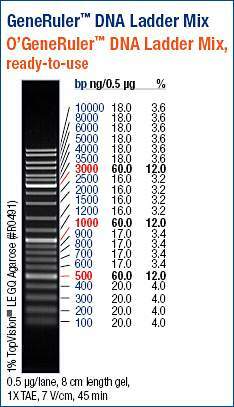 Ladder used was O’GenRuler 100bp DNA Ladder (Thermo-Fisher). No sample was loaded directly next to ladder to facilitate excision, if necessary. Each sample was accompanied by a no template control (NTC). The ehrlichia universal primers (EHR) and the universal 18s (18s) primers are the only two primer sets that do not have contamination present in the NTCs. Excised the EHR band and purified with Ultrafree-DA columns (Millipore). Purified DNA was stored @ -20C and will be used for cloning/sequencing next week. Have already ordered additional primer sets of those above that are contaminated. Will re-run the PCR with those new, sterile primer sets when they arrive to obtain a larger product (the EHR amplicon is only ~350bp). This entry was posted in Ireland Clam RLO ID and tagged 16s/23s, 18s EUK 1134 R, 18s EUK 581 F, 27F/1492R, Apex Red, clam, DNA, EHR16D, EHR16R, EUB A/B, gel, gel extraction, O'GeneRuler 100bp DNA ladder, PCR, RLO, s/6/14/ #19, Ultrafree-DA on 19 February, 2015 by kubu4.